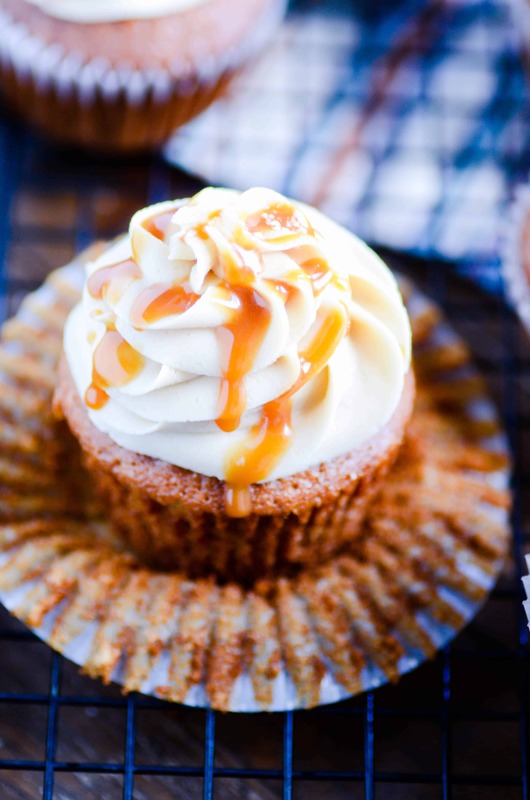 Moist and flavorful apple cider cupcakes with salted caramel frosting on top! I think most of the world is in agreement that this is the BEST time of year for baking. My kitchen is filled with Fall aromatics like pumpkin and cinnamon and apples! There’s nothing cozier than that. Even if it is 85 degrees outside. ???? This is an old, old recipe from that blog that has long past deserved an update– both in photos and the recipe. I first posted this back in 2011, when Something Swanky was just barely breaking into the blogging world. These cupcakes quickly gained popularity, but the original recipe had a lot of problems (as evidenced in several of the comments below ????). Mostly in the frosting department. The original recipe called for melting Kraft caramels and mixing the melted caramels into a buttercream. I’ve since tested multiple methods for making salted caramel buttercream and have decided that there is no shortcut. You can’t use jarred caramel sauce. And you can’t melt down caramels. You really do have to make homemade “caramel” from scratch to make the buttercream work out just right. The good news is: it’s really, really easy. And really not a big deal. Like, I’m not sure why I bucked so hard against doing that in the first place! 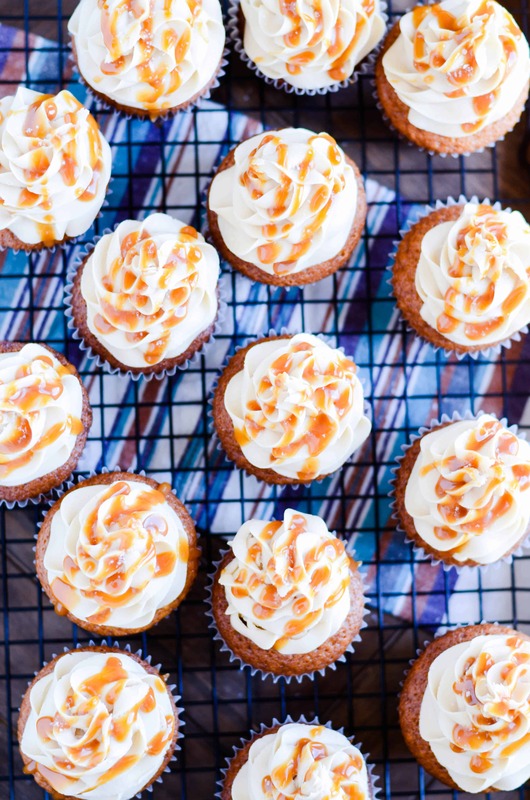 Not to let the salted caramel buttercream completely steal the show here, let’s talk about the apple cider cupcakes underneath. I love these cupcakes. I think they’re a little muffin-y in the taste, almost bran-like. Which is interesting, because the recipe doesn’t even use whole wheat flour. But all the same, it has an oaty, harvest-y (is that a word?) type flavor to it. It’s hearty, but light and fluffy at the same time. 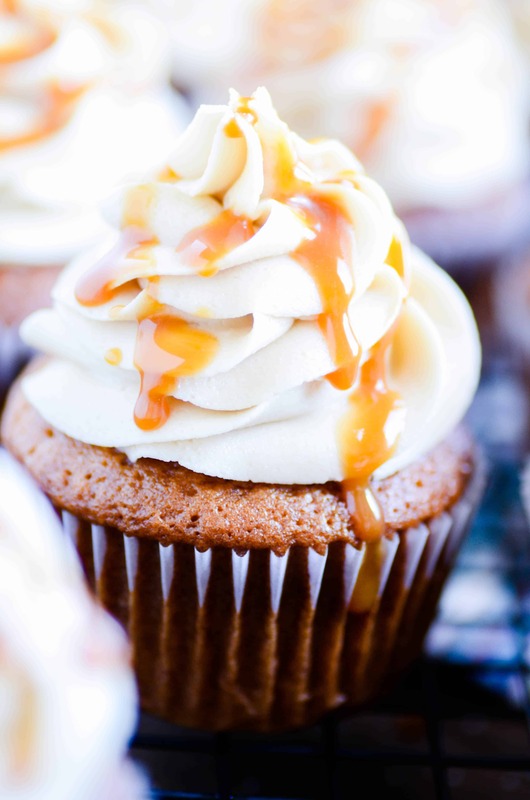 It pairs in a beautiful, cozy way with the caramel frosting. I hope you enjoy these as much as we do! Happy Fall ???? ????! 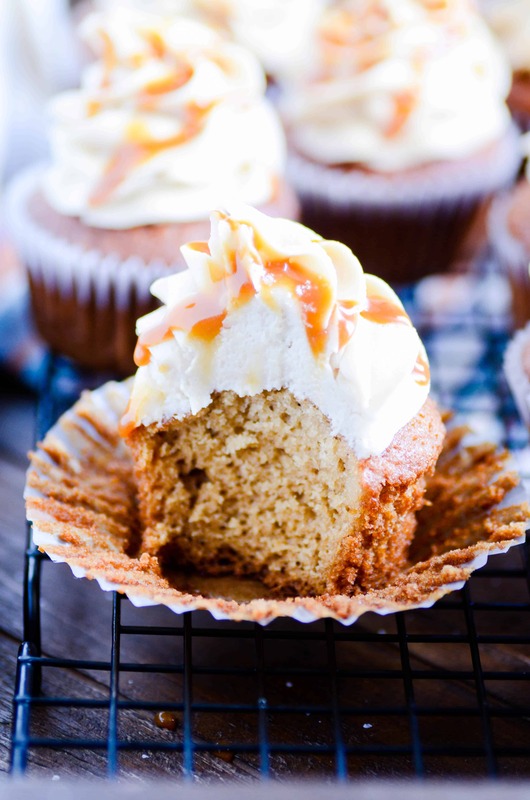 Simple apple cider cupcakes with homemade salted caramel frosting on top. Preheat oven to 350ºF. Line a cupcake tin with liners. Whisk together the butter and sugars. Gently whisk in the eggs, one at a time. Add the vanilla, apple pie spice, flour, baking soda, salt and apple cider. Whisk until batter forms. Divide the batter evenly in the prepared muffin tin. Bake for 20 minutes. Let cool completely. Place the butter, brown sugar, and heavy cream in a sauce pot over medium-high heat. Stir until the butter has melted and the sugar is dissolved. Pour the caramel mixture into the bowl of a stand mixer (you may want to reserve some to drizzle on top of the cupcakes). To speed up the cooling process, place the bowl in an ice bath and stir the caramel until it has cooled to almost room temperature (this shouldn't take long over an ice bath). 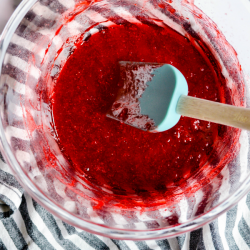 Using the whisk attachment, mix in the powdered sugar one cup at a time. Mix in the vanilla. Scrape down the sides as needed. Pipe the frosting on top of the cupcakes, drizzle with caramel if desired. I added a small pinch of flaked sea salt on top of each cupcake as well. Yum, yum ,yum… what else is there to say? Oh wow, what a great picture! I’m sold! oh dear…these are amazing. No seriously, AH-MAZING! These look incredible…I must try them! I am going to pin this right now so I don’t forget! I will have to try these, they look awesome! Amazing! 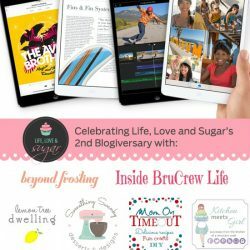 Thanks so much for linking up at Muffin Monday! You sorta need to stop posting such amazing recipes. I can’t take it! Ok. None of that’s true. Thanks for linking up each week to TTT. You make me drool. Oh my goodness, these sound DIVINE!! OMG!! I am drooling. These sound delicious. I love your blog. I’m your newest follower. these sound so delicious! but i think there’s something wrong in your recipe – should there really be a whole stick of butter in the cupcakes? i tried making them and mine came out waaaay too buttery, they didn’t look much like yours at all. @woahitsjulez Sorry to hear that! I just double checked the original source for the cupcake recipe (http://sugarpunk.wordpress.com/2008/11/05/apple-cider-cupcakes-with-caramel-frosting/) and it calls for a 1/2 cup! And I double checked around some other cupcake recipes I use, and that’s about the same amount they call for too. I have no idea what could have gone wrong? I never melt the butter first– did you? Although, I don’t really see what difference that would make since it’s going in the oven anyway… Maybe you didn’t measure enough flour by accident? Sorry it didn’t work out this time! Keep trying though– they were totally worth it! @Something Swanky I thought I had measured everything correctly but maybe I messed something up haha, thanks for double checking the recipe, i’ll try it again if you say it works! Wow do these look delicious – going to try them gluten free! They look swanky and delicious and tasty and like something I need to make soon! Thanks for this recipe. how many cupcakes did this make? thanks! Can you melt the caramels in the microwave? They look delicious! I’m going to make them for a party Saturday! These look divine!!! I’d love to have you link to Seasonal Sundays this Sunday – not just food but lots of Seasonal things! I made these and loved it! I actually liked them better in a mini-cupcake form but I couldn’t get the frosting with the melted caramels to work so I just made my own caramel and caramel frosting. Probably stronger than this version of caramel frosting and overwhelmed the cake a bit. I came across this recipe on Pinterest and made them last night for my family. I loved the apple cider flavor in the cupcakes – they were delcious, but they had the consistency of muffins, as opposed to cupcakes. Also… I think I would cut back on the butter just a tad – they were a bit oily. Is there an ingredient missing in the frosting? I’m an experienced baker, and make homemade frosting all the time. I was surprised to see there was no milk in the frosting. My caramel was the perfect temperature when I added it, and it incorporated well, but the frosting was terribly thick and had the consistency of play-doh. I had to add a few TB of milk, and then it was spreadable. The flavor of the frosting was outstanding (great caramel AND salt flavor), but the consistency was a little odd. I think next time I will sub a little apple sauce for some of the butter in the batter, and make these as a muffin, instead of a cupcake – with no frosting. They would be soooo yummy for breakfast on a fall morning. They would definitely be yummy as a muffin! As far as the consistency of the frosting goes– I’m not terribly sure what where the problem is, since I posted this recipe last year. But, just looking at it, I’m thinking I left out adding a couple of tablespoons of water to the caramel. I can’t specifically remember doing that, but as a rule of thumb I just about always add 2-3 tbsp of water to caramels for melting. So the milk was a good call :) I’ll be sure to edit this recipe to include that! I made these cupcakes last night. They are amazing! I agree that it is more of a muffin texture, non the less the flavor is great! I was just talking to the last person who made them about the consistency of the frosting too. I’m wondering if it’s because I add 1-2 tbsp of water to the caramel before I melt them? I didn’t add them in the directions, because I grew up thinking that’s just what everyone does when they melt caramel. I have no idea why I thought that, but, I’m going back to add in the directions, because I think it will help. and the last person said that she added milk to hers to get it just right. Maybe for next time? Sorry ! Like others, I loved the cupcakes but had bad luck with the frosting (this was before the adding water tip). The frosting came out sort of heavy and oily — it was almost moldable…more of a play-doh consistency, like a previous commenter said. I also had some trouble with the caramel re-solidifying before it was fully incorporated, so there were some caramel strings in the frosting. The flavor was great, just an off-putting texture. I’ll definitely be using the cider cake recipe again, though! Thanks for the feedback. I’ll have to make it again and adjust the recipe! I think part of the problem with the frosting consistency (mine was the same as you described…heavy and oily; not at all like the true buttercream shown in the picture. Unless the picture is not of this exact recipe?) is that the directions are unclear about how much caramel to add. “1/2 bag of Kraft caramels” is not descriptive enough for a pastery recipe. First off, there are multiple sizes of Kraft caramels. Also, not everyone will be able to find Kraft caramels, but perhaps another brand. I think the number of caramel cubes, or better yet a measurement of the number of cups/partial cups of melted caramel, would be best. I suspect I added too much caramel, based on the ambiguity of the recipe, which caused the frosting to not be a true buttercream. Thanks for your feedback. I’ll be re-writing this recipe soon! It seems necessary based on it’s current popularity. I can assure you, I wrote the recipe based exactly on what I made and what you see photographed here. However– I did write this recipe about a year ago, and I’ve learned a lot about how to correctly write a recipe that a massive amount of people with varying degrees of experience will all be able to follow. And this recipe is clearly not written well and long overdue for a re-write. It will be done within the upcoming week! These sound amazing! I just want to double check that the recipe calls for actual apple cider and not apple cider powder mix before I attempt them ;-) I’m so excited to bake these! Does this make a full 24 cupcakes? And no instructions on making the cupcakes? Yes! 24 cupcakes– sorry about the lack of instructions. I think they must have been lost in my switch from blogger to wordpress. I’m working on fixing everything that was lost, thanks for putting this on my radar! I’ll try to have full instructions back up tonight! Ok, I just made these, frosting turned out fine, but I think I like the taste of other recipes better, and I barely got 16 very small cupcakes. I did follow all instructions and the batter baked very airy, and sticks to the liners. Very disappointed, but glad I tried a batch before making for someone with these results. Love, love, love the pictures, I am sure the cupcakes are just as devine! Thanks for posting these, they will definitely be on my cupcake list! 1/3 (approximately) of a 14 oz. jar of caramel topping. I made these last night and they are so good. I used the soft carmel that is used as a dip in my frosting and that worked great. I did not have any of the problems listed in previous posts. I made these today and they were so good. The cake really good and the with the carmel and sakt just finished it off. I was just coming back on here to post this exact thing! I work in a cupcake bakery and when theres butter and sugar in a recipe we cream the butter and sugar, then add eggs, then vanilla then alternate the dry and wet ingredients! It makes it so theres a lot less butter chunks! Makes them super fluffy! Must say these are delicious! I bought a bunch of caramels in bulk. Any suggestions on how many would be equivalent to “half a bag” for the icing? Thanks! hey- cant wait to make these- was wondering tho if you could substitute the melted caramels with caramel topping…. Yes! in fact, I’m probably going to re-write the recipe to suggest doing just that. Apparently, there has been a lot of confusion with the melting caramels and getting the consistency just right, but using caramel sauce seems to work perfectly! Take it slow though, adding the sauce. Don’t add too much at once! I’ll get measurements up hopefully by the weekend! 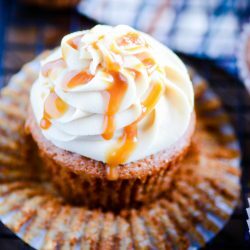 Would this cupcake recipe work as an actual cake recipe? I mean, essentially they use the same batters- how long would you cook it & would it make enough for 2- 8″ cake pans? It sounds like a delicious recipe and might have to see if I can adapt it for a cake. Trying to find a recipe for a baby shower cake for a caramel- crazy momma. Thanks for your thoughts! I think it would work just fine. Bake at 350 for about 35 minutes, and start checking with a toothpick every 5-10 minutes after that. Also– I haven’t fixed the recipe yet, but be sure to melt the caramels with 1-2 tablespoons of water. I made these last night, they’re awesome! I ended up with a lot of extra icing…which I put on the cupcakes too soon so it was a bit melty. I ended up throwing the extra buttercream away but after I ate one of the cupcakes I realized they needed more! How do you get the icing to set so beautifully? i just made these beautiful cupcakes and they taste even better than they look!! we made our own caramel by cooking sweetened condensed milk (still in the can and covered with water) in the crock pot for ten hours, then let it cool in the fridge overnight. i used five tablespoons in the frosting which i made with all butter. i had plenty left over to drizzle over the top. i warmed up the drizzling caramel in a glass cup then transferred it to a plastic sauce bottle. perfection!! there was only one problem: we only got 14 cupcakes and extra frosting. solution: more cupcakes. Just stumbled on your website and I love it! I love this recipe! My frosting came out perfect. My cupcakes looked just the picture! They were a big hit at the bake sale at work. Will make this again!!!! Hi I was wondering if there are any healthier substitutions that can be made? I don’t bake much so I wouldn’t know which the best substitute. 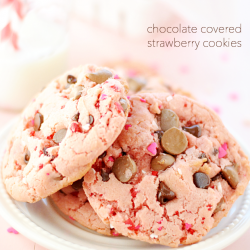 I just tried your recipe….testing it for my little girls birthday party coming up soon! My frosting was “hefty” …even after adding milk…it didn’t seem like it was planning on getting “fluffy”…but still tasted great! Amy suggestions on getting a smoother frosting (more like in your photo) ? I ‘m figuring that the caramel had a little something to do with that. I’d be open to suggestions! Thanks for a great taste combo…the kids loved it….daughter said “there’s a smile in my mouth!” …so I think it’s a keeper for her birthday celebration. Tried it…..I SERIOUSLY could’ve taken a spoon and eaten the batter itself while watching a movie, it was that good. I didn’t. But, oh was I tempted. My husband and I, along with my younger brother and sister demolished these within a day. Amazing recipe.